This is the first of three articles about creating PDF documents using iTextSharp. The Namespace is really big, so I will focus on the parts you'll probably use when you need to create PDFs on a daily basis. There are tons of articles out there but they often just show a specific task, so I thought I might do one simple step by step, starting off with the basics. In this article series I use a web application to show how easily you can create a valid PDF document with just a few lines of code, using the tool iTextSharp which is a free .NET component downloadable at http://sourceforge.net/projects/itextsharp/. (Version 5.0.6) You can easily do the same thing with some other project type, as well, so choose what suits you best. 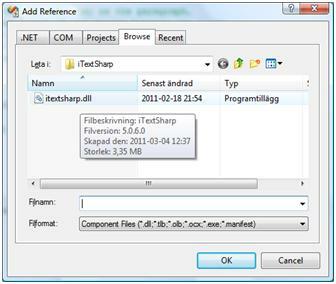 After we have downloaded and unzipped the iTextSharp dll and created our project we need to add a reference to iTextSharp.dll. 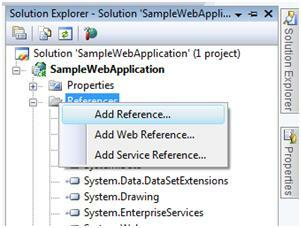 Do that by right clicking the Reference folder in your solution. Select the file by browsing to the save directory and selecting the file iTextSharp.dll. To make the use of the component simple in code, add the following using statements in your code. 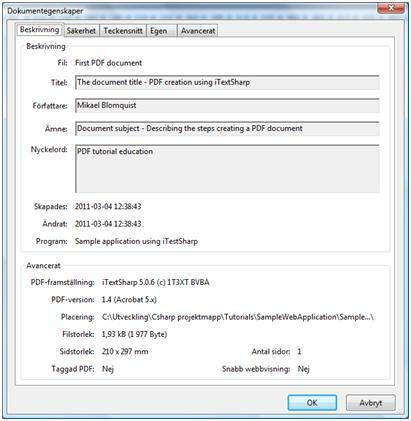 Let's also create a folder where we save our PDF's; right click the solution and add a folder, name it "pdf". Okay, we are now all set to create our first PDF document. First we create a file stream object representing the actual file and name it to whatever you want. To create a PDF document, create an instance of the class Document and pass the page size and the page margins to the constructor. Then use that object and the file stream to create the PdfWriter instance enabling us to output text and other elements to the PDF file. // Writer class using the document and the filestrem in the constructor. Simple, but it is a PDF and that was our goal! Well, I have a Swedish version of Acrobat Reader as you all can see, I mean; as you all CAN'T see (! ), but the fields are self explained. Okay, that's it for Part I. Please, check out Part II describing how to write text, place images and some simple graphics in the PDF document.